Dancing Celestial India (Uttar Pradesh). Early 12th century. Sandstone. H. 331/2 in. (85.1 cm) Promised Gift of Florence and Herbert Irving (L 1993.88.2) Metropolitan Museum of Art, NYC. The contours and richly ornamented surfaces of this celestial attendant to the gods exemplify a stylistic shift away from earlier Gupta-influenced forms. Here the linear play of surface decoration and dramatic contours replace the earlier emphasis on seamless volume and subtle balance. The sculptor has twisted the figure into an extraordinary pose that captures the essence of her dance and seems absolutely believable until one imagines actually trying to turn this way. The jewelry sways and emphasizes her movements, both in the way the necklaces and sashes follow the curves of her body and in the upward thrust of the spiked tips of her crown. The crisp carving of her adornments makes a pleasing contrast with the smooth and rounded surfaces of her flesh. Images of dancing semidivine attendants often appear on the outer walls of Hindu temples. They are placed near the figures of gods to honor the deity, just as actual female dancers honored the gods’ images within the temple. this is what wiki listed? But on the Met Museum one line is written? But in our Indian classical Dance or so to say in other Indian dances there are various pose, Mudras those may seem impossible for west minds? But In many pose/Mudras certain amount of training goes into, before perfecting it. Specially in BharatNatyam, Oddissi dances? Such are few common pose in or dance and Indian milieu? putting the red crimson red called Sindoor on forehead, that is symbol of Married women? But the way it is executed in dancing movement is something is captured the imagination of many artists. Even dancers also execute this movement with grace. Thus sculptors also put their expertise. Somtimes it is putting eye liner, or putting flower in hair plaits? or decorating head forehead etc. all such movements take shapes in various forms of arts. 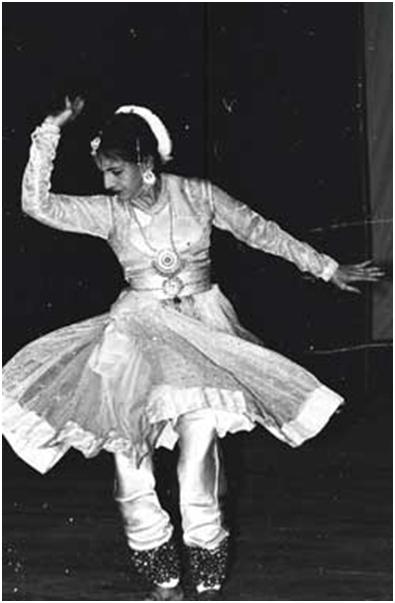 Nritya Samragyi, Diamond of Kathak, Sitara Devi ji. Sahibzadi Zohra Begum Mumtaz-ullah Khan was the actual name of Zohra Sehgal ji. But I knew her most energetic persona. Zohra Sehgal ji. Many years back I saw a TV serial Mulla Nasiruddin on Doordarshan. it was based on stories that we used to hear during childhood. 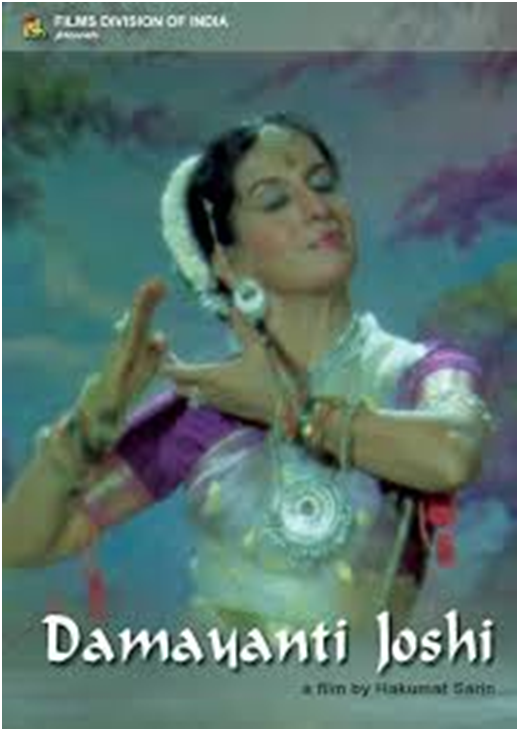 But i had been admirer of Zohra Sehgal ji as i am a student of Dance. 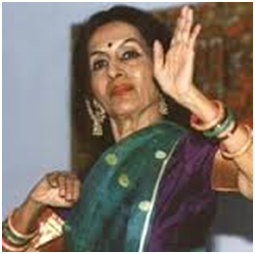 Thus anyone in India who is learning dance must know about Zohra ji. 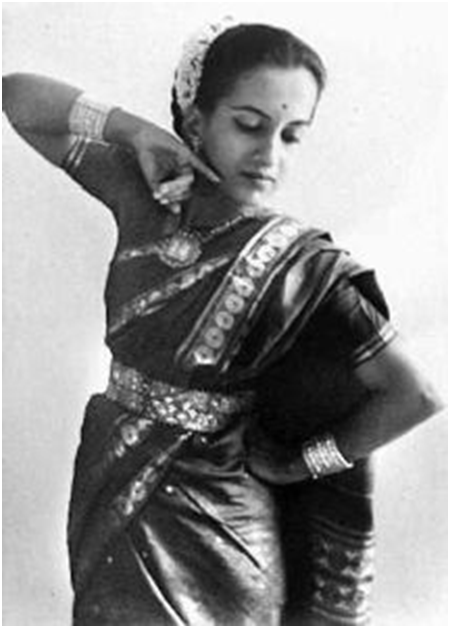 Beacsue she was the leading dancer in Uday Shankar’s dance troupe that toured the world in 1935? imagine that was before India got freedom. And in those days dancing by any girl of a respected family was something unbelievable, it was something like death. But Zohra Sehgal ji was always a fighter. However she got backing from her maternal uncle and few of his friends. With the help of her maternal uncle she went to Europe to study, but she also joined classes in Dance, modern dance. In material available in net she is termed as a tomboy? means during childhood she was not just a girl. She acted in few plays, stage shows withe her sister Uzra in Lahore. She worked in the Prithvi Theatre as leading lady/actor in many stage shows accross India, her sister Uzra ji was already a leading actor of Prithvi Theatre. 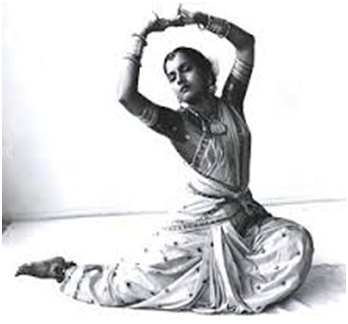 She met Kameshwar Sehgal, when Uday Shankar started his dance academy at Almora(1940). Do you know our great film maker Guru Dutt ji was also learning dance at this academy. Zohra ji married Kameshwar Sehgal. Later they started as school at Lahore, Zohresh dance Institute. But they during migrated to Bombay, and She joined the Prithvi Theatre as an actor in 1945. She worked in few Hindi films also. After death of her husband she moved to Delhi and then to London. There she worked in theatre shows also got opportunity to work in TV series, few on BBC also. World famous and reputed Merchant Ivory production roped her in a film Courtesan of Bombay in 1982. This production house of James Ivory with the Ruth Prawer Jhabvala (the mysterious script writer) has always brought out interesting films on Indian themes. Thanx to Doordarshan that i was able to see few of them. As she was dancer, she also did some choreography in films. most famous i remember the song (dream sequence) in Awara. Her life in London was difficult to an extent but she some how established herself in TV series and films. Once somewhere i had read that she even did some stitching work for firm that was roped in for making curtains for the palace. On Doordarshan when i saw the Jewel in the crown i did not know that Zohra Sehgal acted in the film as lady chaterjee (lili). I only remember a British lady near the end of series says that India actually is the jewel in the crown. Then she acted in Tandoori Nights. later in 90s she got some films also but she did plays with her sister also during this period. She appeared in Salman & Aishwaria starer, film Hum dil de chuke sanam. on 9th July 2014 she passed away. I think she should have got Bharat Ratna. Why she was most respected is that in-spite of the fact that she was born to a muslim family that too in a well to do family, in those times when purdah system was enforced she got education in school and went on to become s stage performer (dance & plays). Imagining about such a life one can really think of the hurdles she might have felt in her life. I or we must salute to the courage with which she worked all her life (independently on her own terms). Art has always fascinated me, particularly the dance. Now a days it is clubbed with performing arts. Do performing arts include dance, playing musical instruments, singing, plays-theatre etc? What about painting, writing, decorating home? When I started appreciating arts at young age, I came to know few artists who were famous at national level; it was only due to the Doordarshan. That was the only channel and it was synonymous of TELEVISION. I saw Smt Swapna Sundari, Chitra Viswesaran, Alarmel valli, followed by Malvika Sarrukai, Prerna Shrimali, Veroniqa Azan, Shobha Naidu, Vanisri Rao, Charu Mathur, Malbika Sarkar etc they were called Young artist back then. Few were famous even more than few elder artists. I am a so called “art enthusiast” and I am very well known among few people and ill famous as a dancer. But till 6 pm I could hold back myself, as the clock proceeded further I lost all resistance. After dropping my son for tuition class I just ran towards the venue, it was late though. As I entered the auditorium with thumping heart I found Hon’ble Lt Governor of A & N Islands was addressing the gathering. Thus I felt some relief, and thought I am not that much late. He is a young artist from Bihar. He started singing folk Songs of Bihar. Then he sang a Purvi, poorvi? accompanied by musicians. These musicians hailed from Port Blair itself. Another star of attraction was this girl named Miss Priyanka Talukdar. 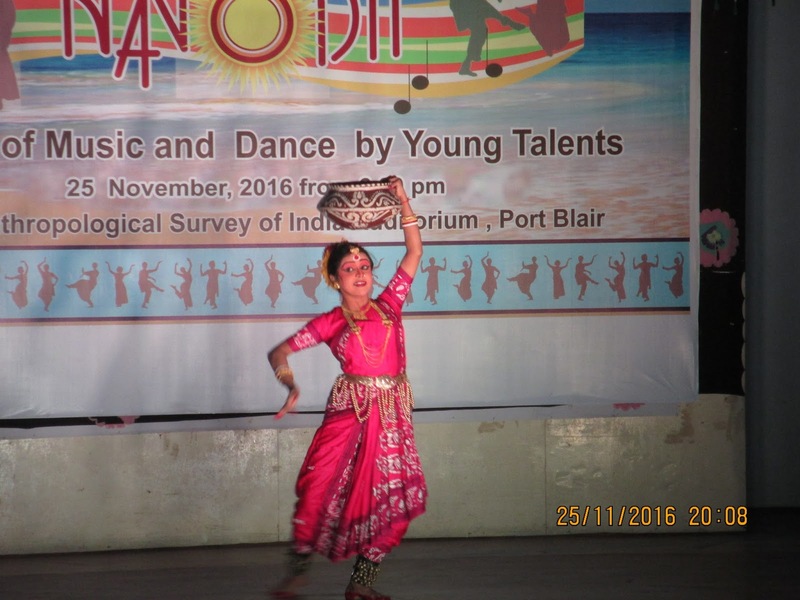 Her father Shri Talukdar has been teaching music in Port Blair for the last many years. I had met him back in 1998 when i was in Educat ion Department. He worked as part time teacher then. But his efforts to teach students has bored fruits now after 20 years. The girl which we saw 18 years back is now performing on stage it was a good feeling. Next was an item as they called it, the folk song of Bengal, but it was a Baul geeti, Baul songs by Dhanonjay Dhibar. He had a good powerful voice. But somehow he has to get into the true feeling of character of a Baul while singing. He tried but as he himself said he was not able to dance as space was not enough in front of the stage. As we know Baul songs are soul touching experience. To feel, to touch that feeling we can not resist dancing on those Baul musical beats coming out of the ektara- one string instrument. I loved the songs of Partha Das. I had a HMV cassette of his Baul Singing. Next came a surprising dance program. 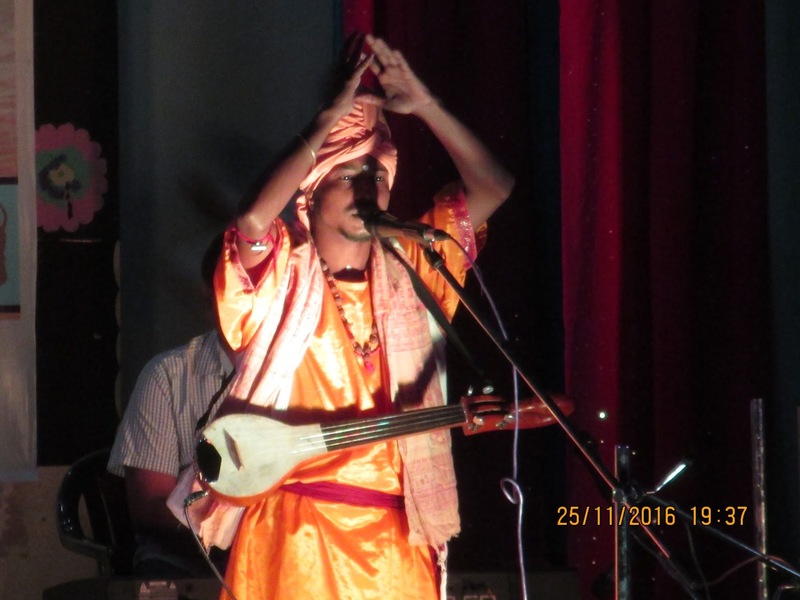 I am sure not many in audiences must have heard the name of Gaudiya Nritya. Years back I saw the Satria dance, on Doordarshan, which took shape in Shatras or Chatras, the ashrams in rural Assam. Often it so happens that we have many rituals and keep on doing since ages but do not know the significance of these rituals. I am connecting to the origination of such dances. So at various religious occasions in rural India people perform dance and sing songs, but keeping all this as just ritual things. And we know in India many dances are associated with the Temple rituals. Even #Kathak was performed by the Kathakars- loose meaning is story teller, in temples. The subject of these stories were mythological. As it is believed the dance as we know Kathak Kathakali Kuchipudi are all evolved from Temple dances. Thus very recently this dance the Gaudiya also have been researched and being presented as classical dance of Bengal. Present dance was performed by the Satabdee Banerjee. Next was the Kathak dance performance by Debjaya Sarkar. I had been s student of Kathak since 1975 in class IV, when one teacher came to teach dance at our school in Kanpur. 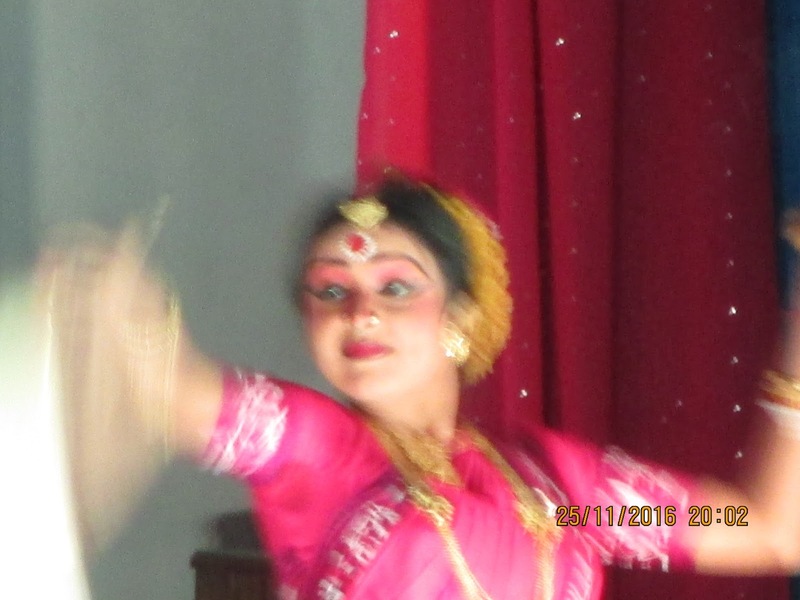 Debjaya shown her caliber in the tatkar and layakari ang as we say in Kathak. She has got training and taken it seriously that reflected in her dance. but still as we all know that abhinaya aspect takes lots of time to be perfected. And experience also teach lots of things as we grow up performing programs. I felt she must have learnt someone who is from Delhi or from Kathak Kendra, as she perfrmed some tukras which belonged to the school of Lucknow gharana and more particularly of Pt Birju Maharaj ji. But now days students learn many things from many teachers thus we cant claim that student belongs to a particular style of dance? whatever they perform is what they are taught? Next came a very nice and serious performance by Sayani Chakraborty. She perfromed lots of adavus and javalis with abhinaya. I dont know but the music was little bit seriuos type for the audience. Those who know something about Bharatnatyam could have appreciated her performance better. I feel in such type of programms, dance with energetic music could have done justification. 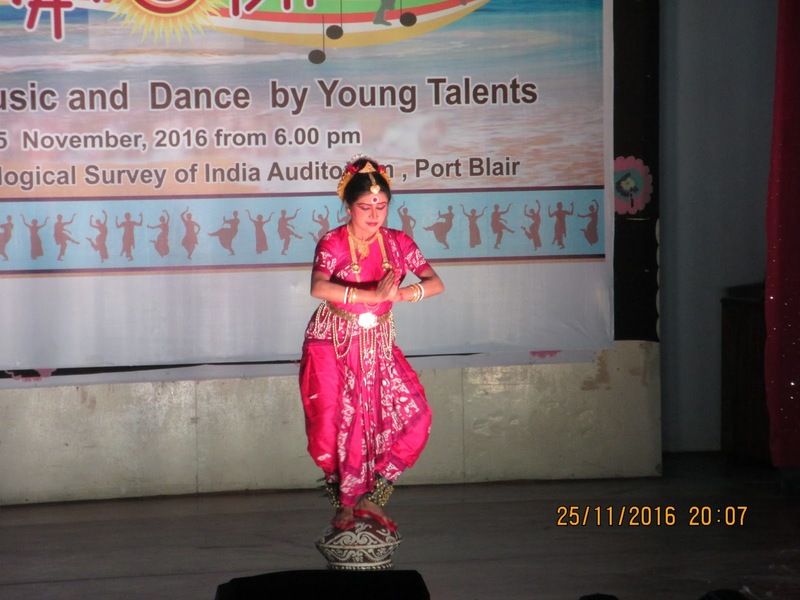 Next was a nice performance of Kuchipudi by the Students of Gauri Shankara classical dance academy, Port Blair. The dance performed by the artists was very good being very young still they shown good potential. there was very much appreciation for these young budding artists from Port Blair. There was this camera from Doordarshan. I tried to peep in to see how they are recording? and captured this screen. this frame came while adjusting my camera and in between clicking the button. The director, Shri OM Prakash Bharati, of EZCC East Zone Cultural Centre prposed the vote of thanks. 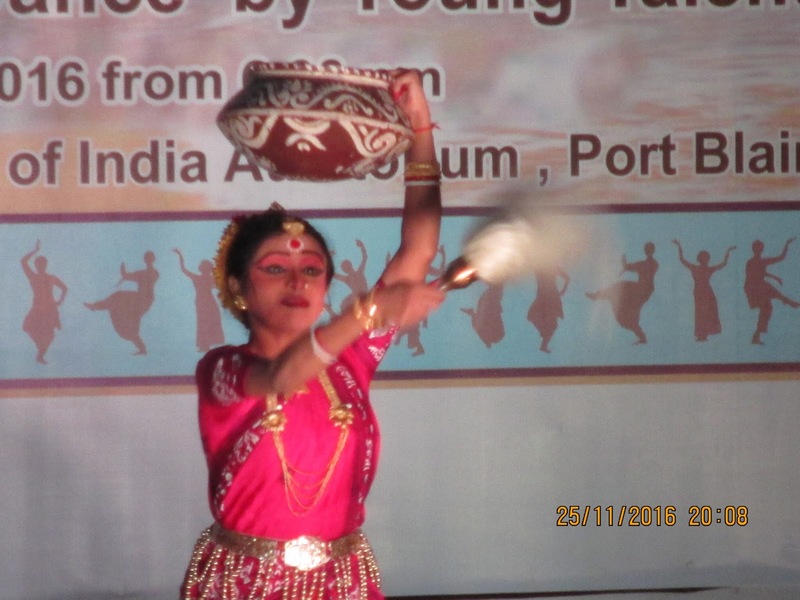 Programme ended with hope to see such events in future also at Port Blair. As such programs are rarely seen in this remote part of India. Due to its remoteness from Mainland this part remains untouched from the experiences, experiments, innovations etc going on in the filed of Performing arts in Mainland India. Thus such programs with more frequency are needed at such remote place like Andaman Nicobar Islands. 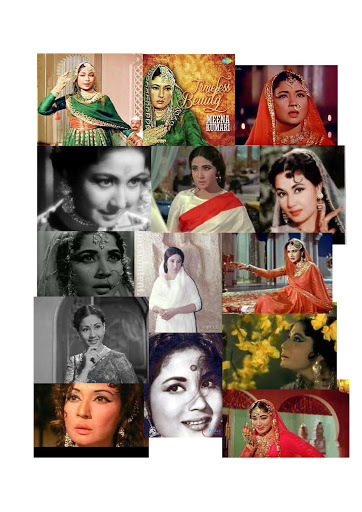 मीनाकुमारी जी की जन्म तिथि पर On BirthDay of most respected Meena Kumari ji. the most awarded actor. Most talented actor of Hindi films. To understand this phenomena- a Super Star of Hindi Films one has to feel in heart. 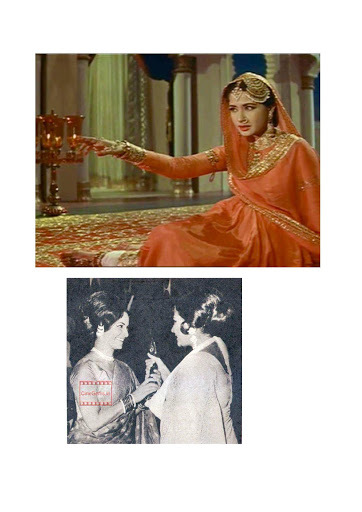 The day i saw Pakeezah, i started dancing. The Music, editing, dialogues, the set design, rushes of frames, Picturisation all were superb and un-matched. As if, each frame was painted by a Painter with great care. 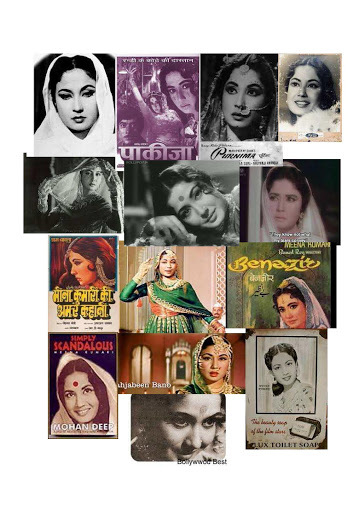 The Character played by Meena Kumari ji came to life on screen with her inborn talent to show emotion. We saw the true Saheb Jaan. When She cried i cried, When she smiled i smiled that was the connection with her& Her screen presence. When she lowered her eyelids and looked at hero through the corner of eyes i felt as if i am doing the same…. When I went to participate in a dance competition held at AND Mahila Mahvidyalaya Harsh Nagar in Kanpur. As i was coming out of college gate, i heard a voice “Thare Rahiyo” it was voice of some girl commenting from my behind? on that inter college dance competetion held at function ABHIVYAKTI in AND college that is a girls college. So it is not that boys always pass comments at girls. But Girls also pass comments? But i think Girls got confidence due to prevalent thinking in society that dancing is a bad thing and that too a boy was dancing on stage, thus it was a collective endevour of a group of girl students of AND Mahila Mahavidyalaya, Kanpur. I am highlighting the perception of society towards the art of Dancing !!! that too if a boy dance. All my school mates knew and remember me by the song “Thare Rahio” and नज़र लागी राजा तोरे बंगले पर “Nazar Laagi raja tore bangle par” also few remember me for “Inhi logo ne” इन्ही लोगों ने छीना दुपट्टा मेरा. What pains me that after 30 years If I get to know that some of my classmates says oh that boy who used to dance? they remember me with that comment. I also see thier posts on social media, in that i see their daughters are learning dance, and that too in US America !! means when they were my classmates for them my dance was a bad thing and an object to redicule me. But as they went to America their daughters learning dance is a good thing. But then this Saheb Bibi Gulam Happened. And I was star struck by acting skills of Meena ji. In the role of छोटी बहु Choti Bahu choti bahu Her acting was superb. The greatest histrionics played ever by any actor on screen of Hindi Films. My respect goes to Shri GURU DUTT saheb also. He casted her in this role? All of her frames in films were unparalleled till today. 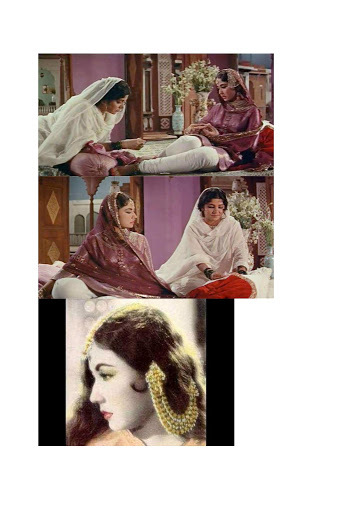 Very recently i came to know that till the date Meena Kumari ji was doing this film she had not touched the drinks. As i have heard that Shri Kamal Amrohi ji had to assist her on acting after drinking. Such great star take birth very rarely on this earth. It was a fine evening at the hall L7in IIT Kanpur. It is a lecture hall but doubled as the best auditorium for all kinds of activities. The L7 was unique, everyone in the IITK Campus knew the destination. Be a film show, natak, a debate, or Lec-Dem of SPICMACAY or dance performance of Swapna Sundari ji, or Music or vocal rendition by Smt GanguBai Hangal. All were held in this L7. There was a show by the Lucknow Kathak Kendra. A team from kendra came to perform. I could not believe my eyes when I saw Smt Damyanti Joshi ji. It was just like a dream. Since at L7, I could easily sneak-in all such programs. I immediately touched her feet to seek her blessings. Long ago I had seen her on Doordarshan. Thus one can imagine what happens to a child when he sees a star which he had seen on TV. I was out of this world. Later when she came to know that I am a keen student of Kathak, She immediately turned towards a Man. She said see it is good that he is willing to join us at Lucknow, we have shortage of boys in Kathak at Lucknow. Later she asked me to come to Lucknow Kathak Kendra anytime. Without any hesitation you come to me- she had told me. No other person had said such words to me before, apart from one person. That another person was wife of our president R Venkentaraman. Once she came to IIT Kanpur campus to visit her daughter, whom I knew as Vijaya Aunty, I went to aunty’s house for some work. There I met her mother. That time R Venkataraman was Vice president. She told that you come to Delhi and inform at gate- so and so has come from IIT Kanpur. I really missed the opportunity to visit the Up-Rasthrapati’s house in New Delhi. Similarly when most respected Damyanti ji said those kind words I was filled with lots of emotions, imaginations etc. But What I could have done at that time. In both instances I was a “nobody”, how could I go to their places. Later after some time I heard that due to some reasons Damyanti ji did not continue as the director, Kathak Kendra, Lucknow. It was not her loss. It was loss of Lucknow. It was a great loss for me personally. 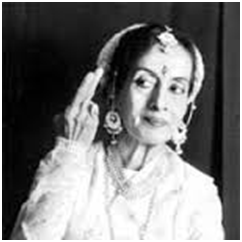 She was the true example of Kathak. Since she had learnt from guru of Jaipur Gharana and also from All the three gurus of Lucknow, Achchan Maharaj, Lachu Maharaj and Shambhu Maharaj. 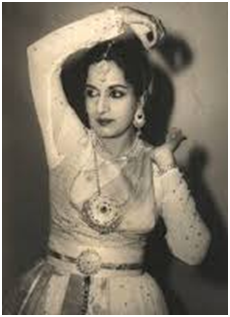 Thus She was a GEM- a Diamond of Kathak. Whose glitter never fades. That is the only quality by which a diamond is recognized. As a four year old child she used to play in the courtyard of a house belonging to the Shokhey’s household. 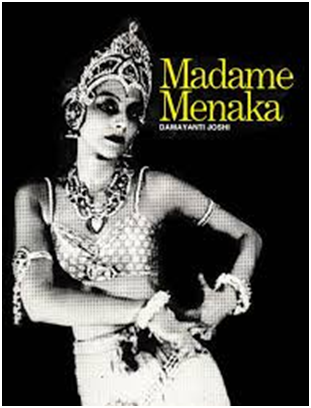 The lady of the house madam shokey was none other but known as Madame Menaka. She was also a great performer, a gifted one. She adopted this child, the daughter of Smt Vatsala. Who was working in this household. Thus began the association of two stars. Under the guidance of Madam Menaka the career of Damyanti ji started charting a path, which always strode upwards. Till Damyanti ji became a glittering star herself. Madam Menaka selected teachers for her daughter-Damyanti ji. Legend has it that when the Guru Mahalingam Pillai the great Nattuvanar started school in Bombay to teach BharatNatyam, Smt Damyanti Joshi was the first student the moment the school started. That tells the alertness both Damyanti ji and Madam Menaka had and behind all, the approval of her mother might have been a great strength. As the training continued under tutelage of various great masters, Damyanti ji with her determination and will power emerged as a true artist. She learnt the intricacies of art-Kathak. She did not follow the art for the sake of fame. She was a true artists at core. Her renditions were pure art. She mastered over the Abhinaya and the “dheer” emotion of taal. As we know Kathak has been used as a chamatkari nritya- that means the dance specially the gunghrus were used to have some surprising effect on the audience, using the high speed laya and taal (beats). So as to mesmerize everybody. But, She chose Vilambit laya, the lowest speed while dancing. Through the slow beat the focus remains on the abhinaya, or so to say, if someone has truly mastered an art, it can be judged only through the vilambit laya-the Slow pace. In another article I read that she did not like the introduction /announcement before any item. As she felt that dance itself should be able to communicate with the Audience. What is the need to inform the audience before-hand. If a dancer tells to audience before dance That means artist has failed in its objective. Kathak means the story telling. If we are not able to convey the story though our gestures then we fail ourselves. She was also master in the Nayika Bhed, or the Astha Nayikas. The eight types of mood or heroines. As earlier I had written about Natraj Gopi Krishna, he was a true natraj and he demonstrated the nayika bhed with added masala. Small little things like pulling the hair pin with teeth and then putting on plait. But Damyanti ji demonstrated within the boundaries as defined in the shastras. She has been credited to introduce the practice of wearing Saree while dancing. I attended several Lec Dem and seminars etc. In one utsav of Kathak at Delhi in evening there was program of Smt Damyanti Joshi ji in the FICCI auditorium. The year is not important. It was I think 1994/95?? It was quite late in night. I was strong lover of dance. I reached the FICCI, but when I entered the auditorium I felt ashamed. Felt very sad. At least when such a star artist and that too a senior artist of her status has come down to Delhi and more over she has the determination to perform herself on stage at that advanced AGE, all the dance fraternity must be present there. But I felt sad that only few days back there was a programme by Smt Uma Sharma ji for Spastic society of India. The FICCI auditorium was full. But when Damyanti Joshi danced in same auditorium not much seats were filled. Only a quarter of hall was with human heads. That day inside me I wept somewhere. But as I am a nobody, whom I could complain. But kudos to that spirit, Damyanti Ji came on stage and danced with gunghroos on her feet. She danced few Tihais and chakardars also. Sometimes it seemed she will fell down. But She composed herself and completed dance. I salute her spirit. I saw her dancing at that advanced age is no sort of miracle for me (as a student of art). Not many from Kathak Kendra were there. However few from organizers and prachin kala Kendra were there too. Photos I have taken from internet. Nowdays anyone can google pictures. But for us the students of arts this medium is very beneficial as we can atleast see many works of arts. Thanx to the Google, The internet which has become a world wide web…..no one can come out of it!!! Google from a noun has become a verb!!! Below is a Newspaper cutting , i have forgot the name, written by Ashish Khokar. It is in my collection of all such odd things that i used to collect during my schooldays. And it was a big problem for my family.